In the past couple of weeks, I’ve been asked about methods to capture and track important or essential performance parameters, generally referred to as “technical measures” in a model-based environment. This post is dedicated to understanding technical measures and how to identify them in the operational and system architecture. Technical Performance Measure (TPM) – TPMs measure attributes of a system element to determine how well a system or a specific system element is satisfying or expected to satisfy a technical requirement or goal. Researching this topic today through the DAU website, you will find reference to Critical Operational Issues (COIs). A COI is an operational effectiveness or suitability issue that must be examined in operational test and evaluation to determine a system’s capability to perform its mission. Notice two things about this definition: first, the definition is focused on operational effectiveness, and second, the verification occurs during operation test and evaluation. The focus is on an operational context together with reference to satisfactorily completing a mission. COIs provide us a connection to a mission area; in other words, for a particular mission, the operational architecture should relate to a COI. Measure of Effectiveness (MOE) – MOEs are measures designed to correspond to accomplishment of mission objectives and achievement of desired results. MOEs may be further decomposed into Measures of Performance (MOP). Measure of Suitability (MOS) – measure an item’s ability to be supported in its intended operation environment. Measure of Performance (MOP) – measure a systems performance expressed as speed, payload, range, time-on-station, frequency, or other distinctly quantifiable performance measures (such as measures related to particular support characteristics including reliability, maintainability, supportability). TPMs, in turn, refine the defined MOPs to further identify individual system element performance. So, following the logic of the latest definitions from DAU, a mission area can be related to a COI and a COI is broken down (or further refined) by one or more MOE or MOS. And, each MOE or MOS is further refined by one or more MOP (at the system architecture level). Finally, a MOP can be further refined by TPMs on individual elements below the system architecture level. Furthermore, if you look at each definition carefully, COI, MOE, and MOS refer to the operational architecture level. And, MOPs and TPMs apply to a system level architecture (i.e. 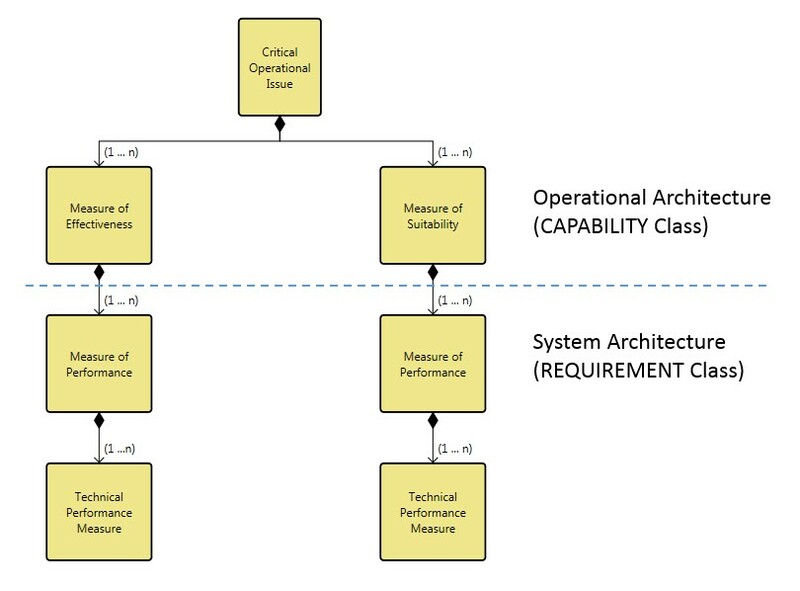 the system architecture or systems which implement the operational architecture). Defining the technical measures can easily be accomplished in the CORE or GENESYS modeling environment. Because some of the measures apply to an operational architecture and some of the measures apply to a system architecture, you need to be utilizing the tool’s Operational Architecture schema. Both the CAPABILITY and REQUIREMENT class have two attributes that allow us to identify technical performance measures. One attribute is named “Key Performance Parameter,” and right below this is the attribute named “Performance Parameter Type.” The Key Performance Parameter attribute is a Boolean data type, which means it is either True or False (and the default value is false). The “Performance Parameter Type” is an enumerated list with a pre-set list of choices. An absolute definition of performance parameters does not exist and how you use this concept may vary from organization to organization or project to project. So, one of the first things you must do for your project is to confirm the selection and definition of technical measures with your customer. Then you must modify the schema to tailor the list of choices for “Performance Parameter Type” on both the CAPABILITY and REQUIREMENT classes. For those entities in either the CAPABILITY or REQUIREMENT class you desire to be a technical performance measure, you can switch the Key Performance Parameter attribute to be ‘True.’ Then, you can select the type of performance parameter to identify an individual entity. Once you have identified your technical performance measures, you can filter either the CAPABILITY or REQUIREMENT class based on either of these attributes and create either a custom hierarchy or table export to provide traceability or review of the entities. In summary, you can easily identify and manage technical performance in either CORE or GENESYS. The first step to including technical performance measures (as in most system engineering management situations) is to have a discussion with your customer to plan and confirm what is needed in the project. Collectively, settle on the names and definitions for the technical performance measures you must track. Then, edit the attributes for the CAPABILITY and REQUIREMENT classes to capture the names and definitions. And, finally, capture the requisite technical information in the model and use the filter, hierarchy, and excel connection features to document the measures. 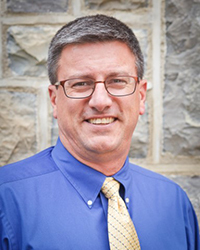 Ron Kratzke is a Principal Systems Engineer at Vitech and a certified systems engineering professional, or CSEP. He is a retired United States Navy officer with over 20 years of engineering experience managing nuclear propulsion plants and combat systems on surface ships. Ron was introduced to the systems engineering practice near the end of his naval career while conducting mission and capability analysis for Navy staff. For the last 16 years, he has worked as a systems engineer supporting advanced systems development for a number of federal government agencies. He was introduced to CORE in 2007 and utilized CORE to manage system development tasks on three different projects over a five year period before joining the Vitech team. He is now a provider of professional services in GENESYS and CORE as well as a central part of the Vitech training team. Thanks for this explanation. A helpful read.